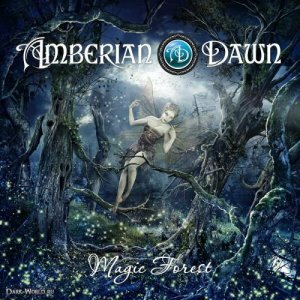 Magic Forest is the fifth studio album from Amberian Dawn (sixth if you include the Re-evolution album). Whether you call it the 5th or 6th album, it's the first time we've had new material sung by Capri and played by the new lineup, since Re-evolution was just a compilation of older songs re-recorded with Capri singing). Having missed hearing the Re-evolution album, I put this album on expecting something similar to the earlier albums, so I was surprised by how different this new album is. The big problem with Amberian Dawn in the past was the vocals. Heidi had a lovely operatic style voice, but there was very little range or variation, so things very quickly got monotonous as things all sounded too similar. With Capri there seems to be a lot more variation in the vocals and that's giving this album a real lift compared to the earlier ones. THe vocals aren't the only change - there's been a big change in the lineup of the band in the last 2 years and this has no doubt contributed to the new album sounding so different. Opening track "Cherish my memory" was a bit of a shock" - I actually had to double check to make sure I'd clicked on the right track rather than an ABBA album, because the vocals really do sound very much like ABBA, and the pop-sounding synth and lack of any noticeable guitar sound early on mean this does sound more like Abba than the Amberian Dawn that people are used to. I like the song but then again I like Abba, so I'm not sure how well this song is going to go down with fans. The next track takes us back towards a more traditional Amberian Dawn sound, but not all the way back - this album has progressed from their earlier sound and is moving much more towards a Nightwish style of symphonic metal. The album has far more variety than ever before both musically and vocally, and together with the shift in their sound the result is nothign short of excellent. There are nice guitar solos, good use of orchestral elements, lots of changes of pace, and some fantastic vocals. One slightly surprising change is the guitars - they are way down in the mix most of the time with the vocals and keyboards far more dominant. I suspect that this will not eb the case in live shows, but here on the album it's a real shift in the sound that might alienate some fans, but in my view it actually works well and avoids the gutiars overpowering the more subtle keyboard or orchestral elements. This is by far the best yet from Amberian Dawn in my opinion. Well worth a listen.